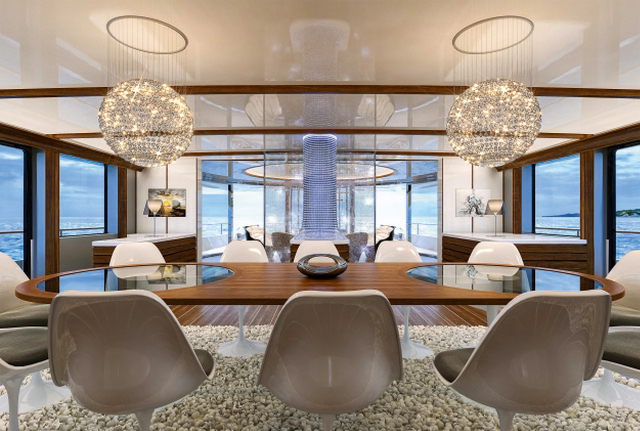 Italian shipyard Mondomarine has had a new company image since 2013 when it was bought from its previous management by two new owners, Alessandro Falciai and Roberto Zambrini. 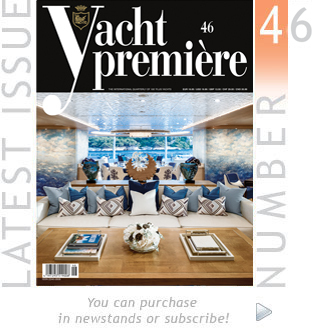 Sales and marketing have been moved to prestigious premises in Monaco, while the shipyard’s show room and facilities on the coast of Savona have been expanded and improved for both new builds and repair and refurbishment projects. All of this took place just in time for a very important The historic shipyard, then known as Cantieri Navali Campanella, was founded a century ago, and became Mondomarine nearly 40 years ago. From an operational point of view as well, the renowned shipyard will be buzzing with activity and countless events this year and next, such as the delivery of the SF40 motor yacht, 40 metres in length, followed by the launches of the M50 super yacht, 50 metres in length, and the M60S mega yacht, a full 60 metres in length and the largest motor yacht ever built in the shipyard’s long history. All three of these vessels are being built entirely in light aluminium alloy, a construction method in which Mondomarine has been a world leader for some time now. Alongside the intensive activity under way in the yard, Mondomarine’s in-house technical office is also constantly at work to develop innovative design proposals that capture the evolving trends on the international market and respond effectively to owners’ current needs. 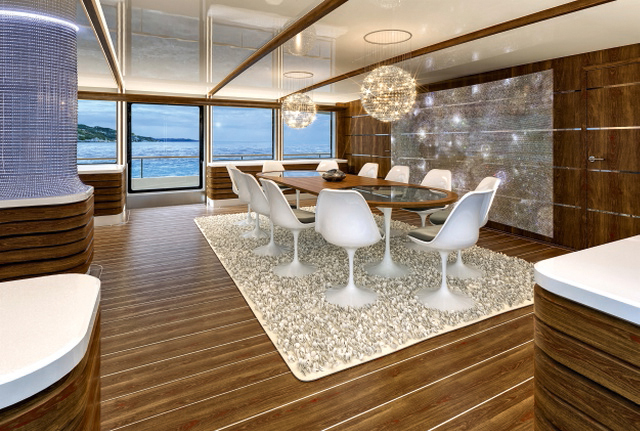 The most recent new design to be published by Mondomarine is the brand new SM45 Project Amerigo, a new generation motorsailer devised in close collaboration with two Italian professionals: Michele Ansaloni, who developed the naval architecture and engineering, and Massimo Franchini, who created the concept design, exterior design and interior design. The motorsailer is ketch rigged with two masts, and has a length overall of 45 metres / 147 feet, a total beam of 9.6 metres / 31 feet and a maximum draught of 5.5 metres / 18 feet. The yacht’s half load displacement is 350 tonnes and she has an international gross tonnage value below 500 IGT. 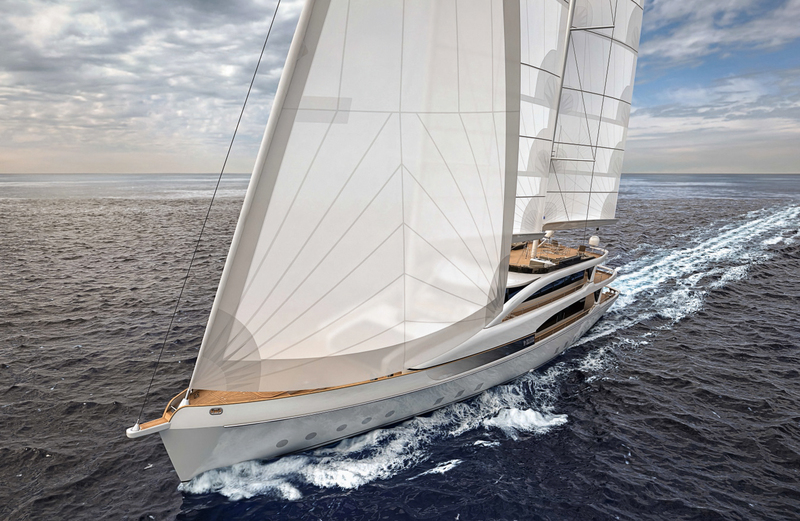 Her sail plan covers 850 m2 / 9,150 square feet, while in terms of motor propulsion she has a single MTU 16V 2000 M61 engine with maximum power of 800 kW / 1,073 BHP, supplied at 1,800 rpm. Under engine power, the yacht will have a top speed of 14 knots, while at her cruising speed of 10 knots she will have a range of 4,000 nautical miles. 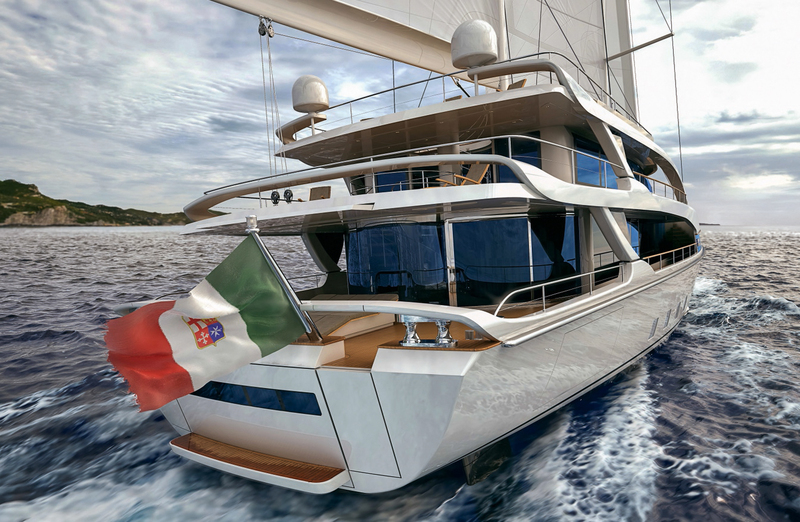 With the presentation of this new yacht concept to the world market, Mondomarine has underlined the fact that the design for the SM45 Project Amerigo is specifically intended to create a genuinely hybrid motorsailer, unlike the approach taken to date in the usual motorsailers that are essentially based on overly restrictive compromises that substantially favour engine propulsion in most cases, or more rarely sail propulsion. 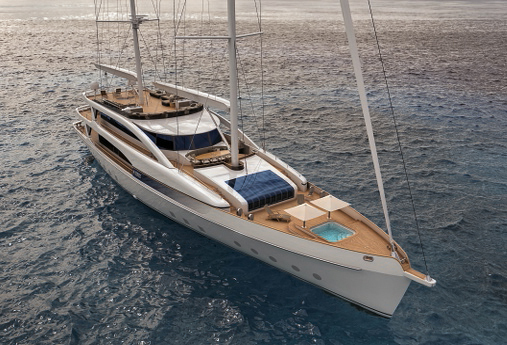 Instead, the new SM45 Project Amerigo takes on the ambitious challenge of breaking with these standards, offering a truly all-sea yacht that can tackle very long voyages on the open ocean while offering maximum autonomy, using a minimum of fuel and ensuring minimal environmental impact. These operational characteristics not only allow a substantial increase in usage options and therefore investment approaches, but also permit a significant reduction in the main management expenses for both charter use and the owner’s private use. This innovative design philosophy is reflected flawlessly in the main technical and build characteristics, starting with the high quality of the naval architecture and engineering where the priority decisions focused on achieving the highest possible reliability while underway and the maximum level of safety on board, while also ensuring maximum efficiency both under sail and under engine power. 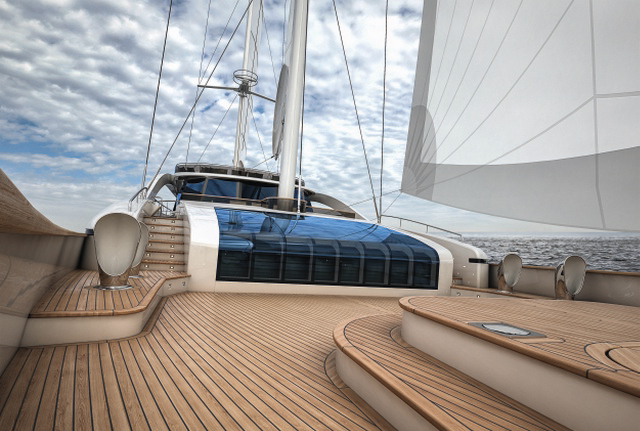 These objectives were pursued through careful design development and superior build quality, choosing the most suitable technical solutions and selecting the best technological components, as the Italian shipyard’s press release explains: “Particular care has been devoted to the study and optimisation of the hull, keel with low resistance tested in towing tanks, additional extensions for better stability as well as reduction of pitch and dive. The hull and superstructure constructions are made of special naval aluminium alloys treated with the most sophisticated protection systems. The concept of the new SM45 Project Amerigo is based on a balanced integration of the technical and aesthetic aspects, in which the primarily functional and rational elements take marked precedence throughout over purely hedonistic elements that draw inspiration only from the temporary, fleeting uncertainty of fashion. The yacht is intended to be lived on and sailed anywhere, rather than to be seen as a “floating object” to be put on display with a fixed mooring in port, and flawlessly represents a balanced union of essential, elegant classical simplicity and an intriguing, exclusive contemporary dynamism. The vessel has naturally been designed for full customisation based on the Owner’s needs and wishes, perfectly interpreting the requirements of the Owner’s personal, individual yachting lifestyle. In spite of her timeless look, the new SM45 Project Amerigo offers rather more exterior and interior space than is usually found on even the latest motor yachts available on the international market. Mondomarine presented the design for the four-deck vessel with a preliminary proposed layout that can be modified at need with numerous options thanks to its intrinsic versatility. 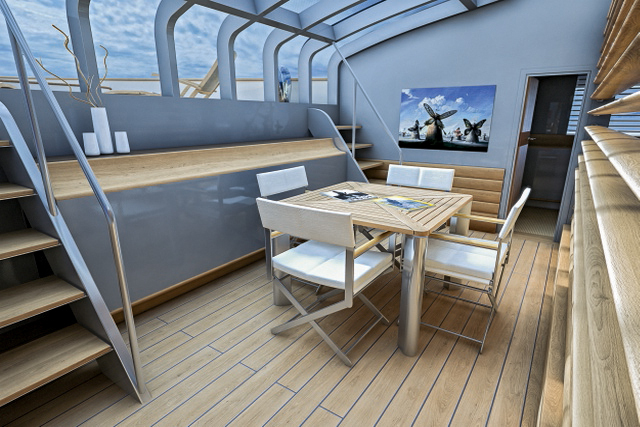 In addition to twin external helm stations, the sun deck can be laid out with a lounge area with comfortable chairs and a bar, as well as a sunbathing area with sun pads and sun beds. Outside on the upper deck, a relaxation area with chaises longues and an alfresco dining area with an oval table and chairs can be set out, while inside, as well as the helm and the captain’s cabin, a pantry and a lounge with sofas and a coffee table are suggested. 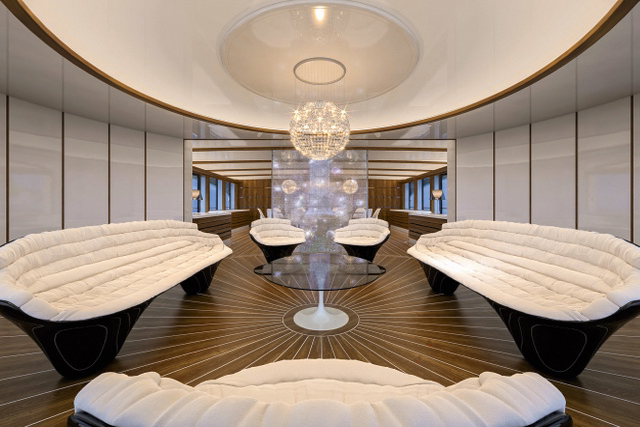 On the main deck, the wheelhouse to aft features a relaxation area with seating and a table, while the salon has a living area with sofas and chairs and can be completely opened up thanks to its curved sliding glass doors, alongside a dining area with a table and chairs. 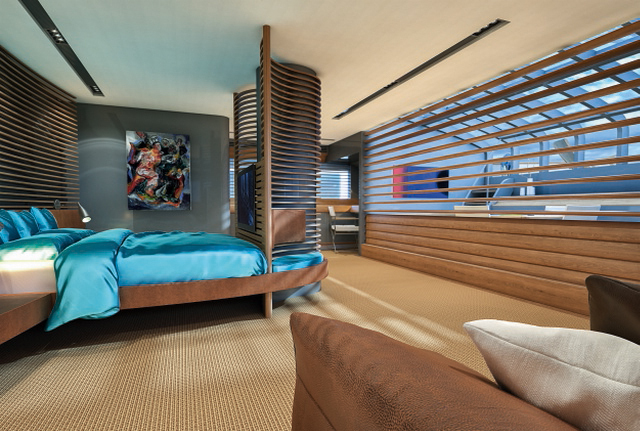 The galley, the pantry and a day head are positioned amidships while the Owner’s suite is located forward, featuring a walk-in wardrobe, a bathroom with shower cubicle and the master stateroom with a double bed and a sofa for relaxation. 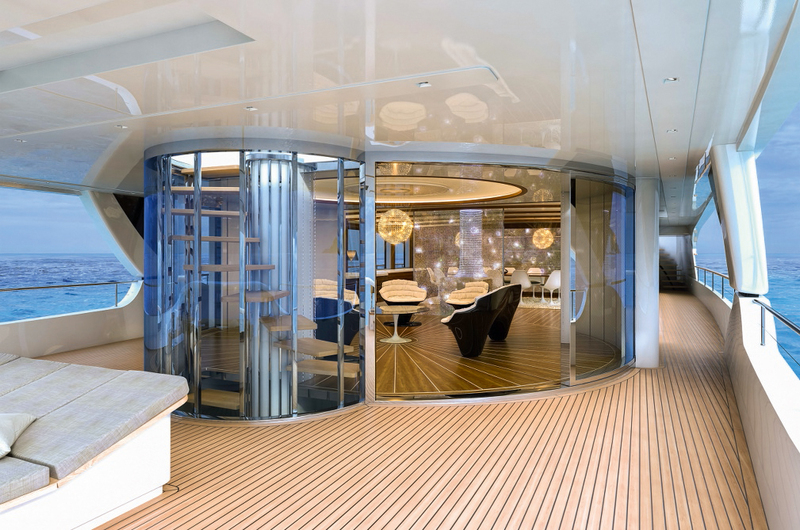 Outside, a private veranda with a breakfast table can be created on the Owner’s private aft deck, which is laid out as a sunbathing area with sun beds and a hydromassage tub. On the lower deck, the garage for the tenders and water toys is located in the stern, followed by the guest area with four staterooms, each with a wardrobe and an en suite bathroom with shower cubicle. 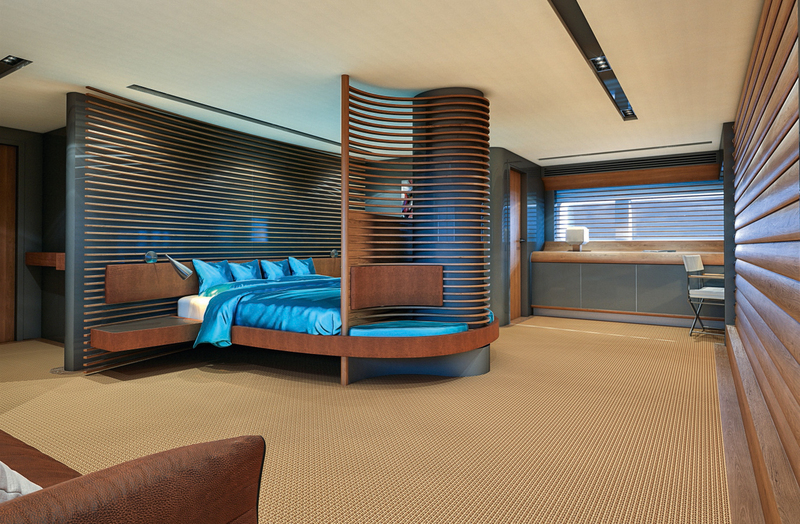 Two of the guest staterooms each have a double bed and the other two each have twin beds. The engine room is positioned amidships, while the crew quarters are located forward with a crew galley, crew dinette and four crew cabins, each with a bathroom, a wardrobe and two foldout bunk beds.